Some of us are born with a different kind of normal. Some of us have differences thrust upon us. But we all end up “broken” at some point. We suffer traumas of all kinds. I use the word trauma because it best describes both the physical and the metaphysical injuries and violence that happen to us. They all have impacts on our physical form. You can tell just by the way we use language to describe what has happened to us. Our hearts get broken, our guts get wrenched, people are a pain in the neck, and our flesh crawls. We literally and not just figuratively, feel all the things that happen to us. They alter our physical being. In fact, emotional traumas can sometimes be more traumatic to the body than physical ones. First of all, when we recall an emotional trauma, our body recreates the chemicals that occurred during that event. The same does not happen with physical pain. Try remembering the time you broke your arm? Do you feel it in your arm? Now try remembering the time you were embarrassed by a close friend? You can physically feel that embarrassment and hurt all over again in your body. It hurts. It physically hurts. That’s not to diminish physical trauma. It can have its own echoing effects. That broken arm may have led to muscle atrophy, scar tissue, or imbalance. You may not remember that initial searing pain, but that doesn’t mean you don’t still feel its effects on you. Our bodies are our stories. Sometimes those bodies are contorted with grief. Sometimes the damage seems impossible to overcome. Sometimes a diagnosis feels like boarding a cliff-bound train that we cannot get off. We see ourselves as broken. We tell ourselves the stories of our brokenness. Sometimes we equate who we are with the injury or the heartache or the illness. We feel like shards of a vessel. And often, there is no cure. In fact, there is never a cure. Things that happen to us never fully go away. Chicken pox may never make us sick again, but there are knots of scar tissue that become part of who we are. We host antibodies for viruses. We hold memories of things we never want to recall. A cure is not possible. We cannot go back to being who we were before it happened. Healing is about getting ourselves to a state of balance. Healing is about feeling whole. Sen no Rikyu had a great understanding of the Japanese value of wab isabi, the idea that beauty is found in what is transient, incomplete or imperfect. 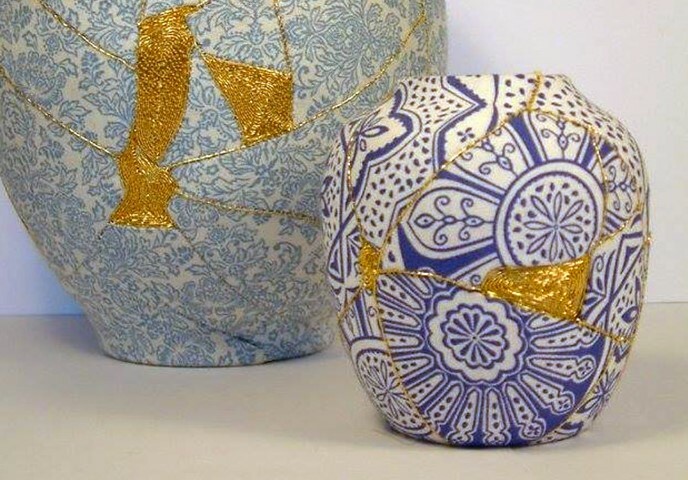 Repairing a pot with gold in the art of Kintsugi doesn’t hide the brokenness, it integrates what has happened to the pot and brings beauty and vibrancy to the very places that were once sharp, jagged and seemed impossible to mend. It makes whole again that which was broken. We can do the same with our own bodies and in our interactions with others. Healing touch can bring about a wholeness that integrates what has happened and create space in the places that are scarred. And we can begin to do this by looking at what is there, the shattered heart, the cesarean section scar, the severed friendship, the torn rotator cuff, or the debilitating diagnosis and seeing them for what they are. And then we can begin telling a new story. The gold is the story we tell and the hand we hold. We are not broken shards. We are whole people who have broken places. And with proper care, healing touch, and a new story, those broken places can begin to shine and tell the world, we are stronger and more beautiful because of them.